Mathura constituency is one of the eighty Lok Sabha constituencies in the state of Uttar Pradesh. The election here will be conducted on April 18, 2019 as per the Phase II schedule. Mathura is located approximately 50 kilometres north of Agra, and 145 kilometres south-east of Delhi; about 11 kilometres from the town of Vrindavan, and 22 kilometres from Govardhan. It is the administrative centre of Mathura district of Uttar Pradesh. Lok Sabha Elections 2019 Schedule: Voting In 7 Phases From April 11 to May 19, Counting And Results On May 23; Check All Dates For General Elections. In the 2014 Lok Sabha Elections, Hema Malini of the Bharatiya Janata Party (BJP) won this Lok Sabha seat. Jayant Chaudhary of the Rashtriya Lok Dal (RLD) was at the second spot and Yogesh Kumar Dwivedi of the Bahujan Samaj Party (BSP) ended up at the third place. 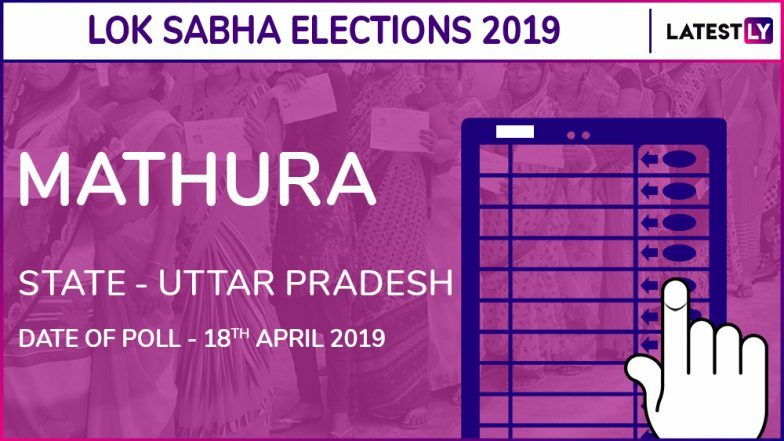 Uttar Pradesh Lok Sabha Elections 2019 Schedule: Constituency Wise Dates Of Voting And Results For UP General Elections. This time from Mathura, the BJP's candidate is Hema Malini, the sitting MP from the seat. The Congress's candidate is Mahesh Pathak. While the Ajit Singh led RLD has declared Kunwar Narendra Singh as the candidate from this seat.